Three-time recipient of the ALG Residual Value Award, the Hyundai Elantra is one of the most affordable vehicles on the market, and for 2014, it receives a refresh with all-new enhancements and design modifications. Some of these changes include revised exterior components, new technologies, fresh safety features and NVH improvements. A new Elantra Sport model has also joined the lineup and the Elantra GLS has been renamed the Elantra SE. To discover more info about the 2014 Hyundai Elantra in Arlington, continue reading our short summary below; then scroll down for extra details on its specifications. 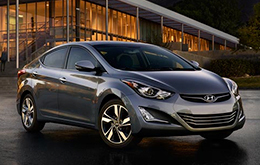 On the outside, the 2014 Hyundai Elantra has received a new lower grille, enhanced fog lights, projector headlamps with LED accents, LED taillamps, a revised front fascia and new 17-inch alloy wheels. Driving dynamics have also been altered with the introduction of a new Driver Selectable Steering Mode on Elantra SE and Limited models. The new Elantra Sport receives the most changes, sporting a large front stabilizer bar, stiff dampers and rear springs for improved front roll control - mentioned in several 2014 Hyundai Elantra reviews. It is also equipped with a 2.0L Nu GDI four-cylinder engine, producing 173 horsepower and 154 lb.-ft. of torque, and matched with either a manual or automatic transmission, delivering top performance. The Hyundai Elantra's interior features have also been upgraded for the new year and are better than ever. A new aluminum entrance, aluminum pedals, straight pull transmission selector and HVAC vents, enhance the sedan's aesthetic appeal, while a new 4.3-inch touchscreen audio display with a rearview camera (on Limited and Sport) and available Pandora Internet Radio show off its technology offerings. A seven-inch touchscreen with the latest navigation system, offered on Elantra Limited, also leaves Arlington buyers impressed. 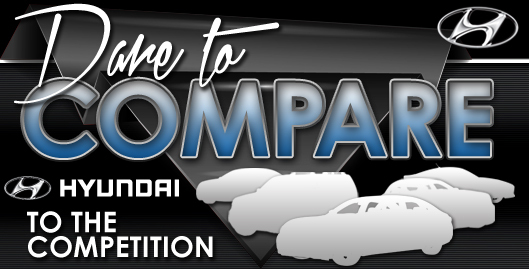 The 2014 Nissan Sentra, Chevrolet Cruze, Mazda3, Ford Focus, Honda Civic and the Toyota Corolla are no match for the 2014 Elantra! Just compare Hyundai's most current model head-to-head with them and you'll learn that it ranks above the competition easily. You'll love the Elantra's long list of outstanding characteristics, including its cut-rate price and cutting-edge cabin amenities. When compared to the aforementioned vehicles, in terms of price it's clearly a phenomenal value, making it a first choice among Hyundai customers in Arlington. Check out our bullets for more details about what it offers! 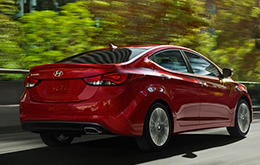 Do you want to know more about the 2014 Hyundai Elantra's features and specs? After reading the review above, visit Vandergriff Hyundai and experience the Elantra up close. Well-versed automotive writers put in many hours of research to write the reviews on our site. Want to know about the 2014 Elantra's cabin amenities and other specs? As your Hyundai dealership, you can count on us for credible information. 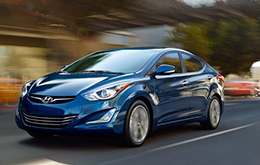 Thank you for reading over Vandergriff Hyundai's 2014 Elantra review. Now that you know more about the Elantra, pick up the phone and call us to learn about limited-time dealership offers and national incentives that can help you save on your purchase.